We have been pulling our 13 foot Burro with 2 L diesel‘s since 2003. Our current car is a 2016 BMW wagon. The best we’ve gotten pulling the trailer is a tic over 30 mpg on a 700 mile round-trip with a tailwind both ways. Average is about 27 Mpg. Usually don’t drive above 70. I have cruised at 80 and mileage dropped to 22–23. Without the trailer on the highway the car gets @ 50 mpg. The eight speed transmission really keeps the little diesel in the sweet spot. Towing I put it in sport mode which firms up the suspension and stops it from shifting into 8th gear. Ford E350 6.0 PSD. I have put on 42,000 miles and the overall average is 17.5 mpg. I have Michelin AT2 tires. No mods. This is a combined city, camping, mountain driving-everything! This van is a beast. Surprised at the fuel economy. I drive the speed limit. If it is posted 80 MPH, I am cruising at 80 MPH. 2001 Chinook Concourse XL - E350 V10 DRW, 9,500lbs, only had for short time but on 18 hour drive back averaged 10.5mpg at an average 68mph. Normal driving getting between 10.5 and 11.3, depending on road - (readout from ScanGuage II). 2014 Jeep Grand Cherokee Overland, V6 Pentastar, 140k miles, highway 21mpg, city 18.5 - 19.5 mpg. I have found that the more I read forum threads on MPG the higher my MPG gets. I'm up to like 40 mpg now. No crap! I get 40 in my Transit pulling 3 military trailers uphill. My V10 I just sold got 45 with a load of bricks in the back on washboard. I just bought a little commuter car, 300 miles per gallon! I have a high roof extended 2016 Ford Transit and thus far I have put right at 38k miles on it. It has a 3.7 with 4.11 rear end. The best mpg was 22 driving across Missouri & Illinois west to east on US 36. I dove 55 the whole tank. On on the 3600 mile trip to Colorado/Utah from Indiana, doing 55 on the main secondary roads and whatever on the forest service roads I averaged 19.8 for the trip. I drive with a very light foot. I did not encounter any heavy head winds. Driving it back & forth to work 8 miles each way I get 17. It is a very light camper with a galley cabinet, overhead cabinets, Truck fridge 130, 2-105 Ah agms, cassette toilet & a raised bed. This summer heading into heavy head winds in Kansas at 65 mph I got 15, I also had a Suzuki DR200 mounted on the bumper. 11.5 mpg no matter what. E350 EB 5.4 with 4.11 on 33 Michelin LTX AT2. I have no idea what mileage I would get if I keep it below the speed limit. 06 E250 5.4 Clydesdale TTB 4x4, 3.73s, 265/75R16 Duratracs, 265K km. 10-11 around town, 13-14 highway. I have 3 vans: 1993 302 RB smb - 12.7 mpg combined. 1998 chevy EB smb - 12.6 combined, 1999 5.4 coachmen class b -12.9 combined. They are all lifted on 265 tires. 2007 Chev 1500 Express AWD. 3" lift, 285/35/16, roof rack, awning and camperized. 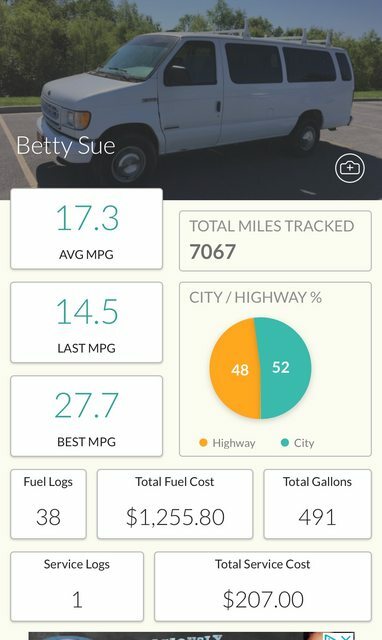 I have averaged 15 US mpg over 20K miles. About 80% HW, 10% City and 10% gravel and off-road. We average 65-70 on the HW. I have to add that I have not calculated for the larger tire I run now. The speedo is about 2-3 MPH off at 65 mph according to my GPS. So add 10ish% to my reading to get actual MPG. 16.5 USmpg. I'm OK with that.